This November the University of British Columbia’s Be Well at Work project held a study Celebration Wrap-up event at the University of the Fraser Valley (UFV). Dr. Carolyn Gotay, a Professor in the Faculty of Medicine at the University of British Columbia and the Canadian Cancer Society Chair in Cancer Primary Prevention, was principal investigator of the study. At the event, she told the group that almost 700 BC workers took part in the study, and results indicated that participants increased healthy behaviours including weight loss and fruit and vegetable consumption. The audience also heard from motivational speaker and UFV faculty member Brian Justin on how to fit healthy living into everyday life. 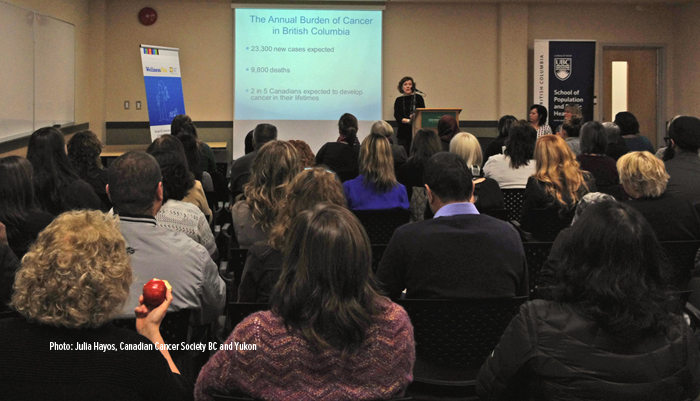 The Be Well at Work project was a partnership between the University of British Columbia’s School of Population and Public Health and the Canadian Cancer Society British Columbia and Yukon, with funding from the Canadian Cancer Society. The project focus was on decreasing employees’ cancer risk through promoting healthy lifestyles. UFV employees had the opportunity to participate the Canadian Cancer Society British Columbia and Yukon’s comprehensive workplace wellness program, WellnessFits. Being healthy at work is more important than ever. In 2004, Health Canada reported that 67% of adults spend more than 60% of their time at the worksite. The workplace has become a key location to encourage healthy practices and to reduce cancer risk — it’s estimated that one third of all cancer cases can be averted through appropriate diet, physical activity, and weight control.